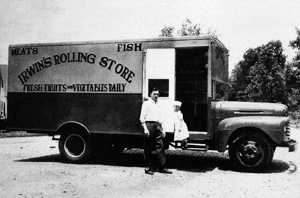 An old school bus was converted for Irwin's Rolling Store which operated in White County from 1945-1955. The Tennessee General Assembly established White County on September 11, 1806, from a part of Smith County and named the new county for John White, one of the first settlers in the area. The Knowels, Rascos, and Swindells were among other early settlers; John H. Howell brought his family from North Carolina to a cave near Burgess Falls. White County’s first court was held at the house of Joseph Terry at Rock Island, now in Warren County. In 1809 the state legislature authorized the establishment of a county seat at Sparta. Commissioners Thomas Bounds, Benjamin Weaver, Aaron England, Turner Lane, James Fulkerson, Alexander Lowry, and Nicholas Gillentine laid out the town. The first courthouse was constructed of logs in 1810; in that same year, Eli Sims, a native of Ireland, came to White County. He established the county’s first cotton gin, and in 1824 he and his slaves built a two-story brick house that still stands outside of Sparta and is recognized as the county’s first brick dwelling. White County furnished soldiers for the War of 1812, the Mexican War, and the Civil War. In addition to the men who served on both sides of the Civil War, aggressive partisan units on both sides settled old scores and kept the Upper Cumberland in turmoil. The most notorious of these partisans was Samuel W. “Champ” Ferguson. General Braxton Bragg also moved his army through Sparta on his way to Kentucky in 1862. White County contained valuable natural resources in coal and timber, which were exploited fully from the 1880s to the Great Depression. Coal mines and towns were established at Eastland, Ravenscroft, Clifty, DeRossett, and Bon Air and affected the lives of thousands of residents. The first coalfield was at Bon Air, established in 1882 by Sparta resident General George Dibrell, who owned fifteen thousand acres in White County. But the real power behind the venture was probably the Nashville, Chattanooga and St. Louis Railroad since its president, E. W. Cole, also served as chairman of the coal company’s executive committee. The mine was an immediate success, and by 1884 the railroad had extended a spur from McMinnville to Sparta. Three years later, the line was extended to Bon Air, and by 1905 the branch reached the mines at Clifty and Ravenscroft. Between 1888 and 1904 Bon Air Coal Company and the Clifty Creek Coal and Coke Company established four towns on the plateau overlooking Sparta. Bon Air owned at least thirty-eight thousand acres and employed six hundred men from both White and Cumberland Counties. Over the next two decades, the mines increased production and in 1920 White County was the sixth leading coal producer in Tennessee. In 1917 William J. Cummins and other investors acquired the properties and later established the Tennessee Products Corporation. Its headquarters was at Ravenscroft, where it operated the state’s only coal shaft mine, along with a coal-distillation plant, until 1936. Lumber was taken in vast amounts during the early twentieth century, at first in support of the continual mining expansion and then as a resource in its own right. The Sparta Spoke Factory was one of the region’s largest. During World War I White County walnut was in great demand for gun stocks, which were ordered first by Allied nations and then by the federal government in 1917. To serve the increased freight traffic, the railroad built a modern depot, now listed on the National Register, in 1917. Sparta grew markedly during these decades of industrial investment. Thomas L. Sperry was a leading merchant and builder. His National Register-listed home, constructed ca. 1880, overlooks the town square. A Main Street residential historic district displays popular domestic styles of the early twentieth century and contains Queen Anne, bungalow, Four-Square, and Classical Revival dwellings. The construction of the Memphis-to-Bristol Highway through the town during the mid- to late 1920s also influenced the town’s built environment as a new residential district developed along Gaines Street. In fact, good roads have always been important to the county’s economic health. East of Sparta is the Sparta Rock House, constructed 1835-39, a tollhouse that served antebellum travelers on the Knoxville-to-Nashville turnpike, first built in 1815. White County’s famous residents include bluegrass legend Lester Flatt, a member of the Country Music Hall of Fame. Its nearby recreational facilities include the Calfkiller and Caney Fork Rivers, the Virgin Falls and Burgess Falls State Natural Areas, and Rock Island State Park. The Sparta Expositor was founded by L. D. Hill and his brother. In 1880 they sold the paper to R. P. Baker. Other owners have included James B. Snodgrass, Charles G. Sims, Floyd Bryan, Wendell Gentry, Coleman Harwell, and Bobby and Logie Anderson. Suzanne Dickerson has been the editor and publisher of the Expositor since 1994. The largest industry in White County is Mallory Controls, which produces appliance timers, switches, and water valves. The county population is 23,102 people, according to the 2000 census.